The history of Christianity, crowded as it is with crimes of the most horrendous kind, provides a running commentary on the Christian doctrine. And the biggest share in Christian crimes down the centuries can safely be allotted to the Roman Catholic Church, its head, its hierarchy, its theologians, its religious orders, and its missionaries. There is, however, one criminal field in which the Roman Catholic Church has remained unrivalled. No other Christian denomination — these are as many as 23,000 of them — comes anywhere near the Roman Catholic Church when it concerns committing of blatant forgeries and foisting of pious frauds. It is no exaggeration to say that starting with Jesus Christ, the entire doctrinal and institutional edifice of Catholicism rests on a series of staggering swindles. The Roman Catholic Church in India has remained true to the tradition. The literature it has produced during the last five centuries is full of lies of the filthiest sort, not only about Hindu religion and culture but also about its own ‘religion’ and role. And this garbage heap is topped by the hoax about the so-called St. Thomas. 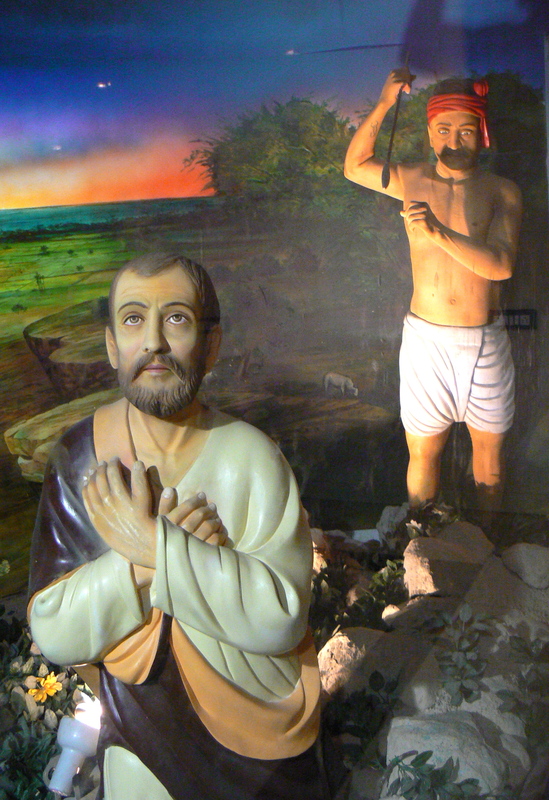 We are told by Catholic ‘historians’ that Judas Thomas, a brother as well as an apostle of Jesus Christ, had landed in Malabar in 52 AD, founded the Syrian Christian Church, and travelled to Tamil Nadu for spreading the Good News when he was killed by the ‘wily Brahmins’ in 72 AD at the Big Mount (now called St. Thomas Mount) near Madras at the behest of a Hindu king named Mahadevan. The San Thome Cathedral on the beach in Mylapore is built on the spot where the saint is supposed to have been buried. This spot, like many others of the same spurious sort, has become a place of Christian pilgrimage not only for the flock in India but also for the pious Christians from abroad. I had examined the story of St. Thomas in 1986 when I wrote a book on the Papacy during the Pope’s visit to India. I had discovered that while some Christian historians doubted the very existence of an apostle named St. Thomas, some others had denied credibility to the Acts of Thomas, an apocryphal work, on which the whole story is based. Even those Christian historians, who had accepted the fourth century Catholic tradition about the travels of St. Thomas, had pointed out the utter lack of evidence that he ever went beyond Ethiopia or Arabia Felix. The confusion, according to them, had arisen because these countries were often mistaken for India by ancient geographers of the Graeco-Roman world. Firstly, it is one thing for some Christian refugees to come to a country and build some churches, and quite another for an apostle of Jesus Christ himself to appear in flesh and blood for spreading the Good News. If it can be established that Christianity is as ancient in India as the prevailing forms of Hinduism, no one can nail it as an imported creed brought in by Western imperialism. Secondly, the Catholic Church in India stands badly in need of a spectacular martyr of its own. Unfortunately for it, St. Francis Xavier died a natural death and that, too, in a distant place. Hindus, too, have persistently refused to oblige the Church in this respect in spite of all provocations. The Church has had to use its own resources and churn out something. St. Thomas about whom nobody knows anything, offers a ready-made martyr. Thirdly, the Catholic Church can malign the Brahmins more confidently. Brahmins have been the main target of its attack from the very beginning. Now it can be shown that the Brahmins have always been a vicious brood, so much so that they would not stop from murdering a holy man who was only telling God’s own truth to a tormented people. At the same time, the religion of the Brahmins can be held responsible for their depravity. Fourthly, the Catholics in India need no more feel uncomfortable when faced with historical evidence about their Church’s close cooperation with the Portuguese pirates in committing abominable crimes against the Indian people. The commencement of the Church can be disentangled from the advent of the Portuguese by dating the Church to a distant past. The Church was here long before the Portuguese arrived. It was a mere coincidence that the Portuguese also called themselves Catholics. Guilt by association is groundless. Lastly, it is quite within the ken of Catholic theology to claim that a land which has been honoured by the visit of an apostle has become the patrimony of the Catholic Church. India might have been a Hindu homeland from times immemorial. But since that auspicious moment when St. Thomas stepped on her soil, the Hindu claim stands cancelled. The country has belonged to the Catholic Church from the first century onwards, no matter how long the Church takes to conquer it completely for Christ. But the leviathan which had ignored the serious doubts expressed by renowned Christian historians could not be expected to take notice of what an almost unknown Hindu had to say on the subject of St. Thomas. The Catholic Church in India went on spreading the myth merrily. Meanwhile, the Liberation Theology of the Church had added a new dimension to it. St. Thomas started being sold not only as the first founder of Christianity in India but also as the first to proclaim a new social message in this country. The Express Weekend of Madras dated 30 December 1989 presented this new portrait of the ancient Christian saint in an article written by C. A. Simon under the title, ‘In Memory of A Slain Saint’. Besides providing the standard Catholic ‘history’ of St. Thomas and the cathedral at Mylapore, the article struck the following new note: “St. Thomas spent the last part of his life in Madras preaching the Gospel. A large number of people listened and embraced the way of life preached by him. The oppressed and down-trodden followed him and claimed equal status in society as it was denied them by the prevailing social norms. He condemned untouchability and attempted to restore equal status to women.” (emphasis added). The Christian scribe had written with great confidence because similar stuff, presented in a plethora of books as well as the popular press, had passed off without being challenged. He was not aware that Hindu scholars had started examining Christian claims about Christian doctrines and Christian saints, as also Christian calumny about Hinduism, Hindu society, Hindu culture, and Hindu history. Nor did the editor of the Express Weekend, a Hindu by accident of birth, anticipate the spate of letters and articles which he soon had on his desk from knowledgeable Hindus. He did his best to suppress the true facts about the so-called St. Thomas and his so-called tomb at Mylapore. The first Hindu salvo came from Ishwar Sharan of Madras. In a letter to the Weekend Express he pointed out what Christian historians such as R. Garbe, A. Harnack and L. de la Vallee-Poussin had stated long ago about the spurious character of the Acts of Thomas. He also cited Bishop Stephen Neill’s warning to Christians against accepting the St. Thomas story as serious history. But what was more significant, he made known for the first time to the lay readers that the “St. Thomas Church stands on the ruins of a Jain Neminathaswami temple and a Hindu Shiva temple which had a Nataraja shrine attached.” The fact that Jain and Shiva temples stood at the site where the St. Thomas church stands now, stated Ishwar Sharan, was vouchsafed by inscriptions discovered in the church compound and recorded in a scholarly book, Jain Inscriptions in Tamil Nadu, compiled by A. Ekambarnath and C. K. Sivaprakasam and published from Madras in 1987. In another book, Indiavil Saint Thomas Kattukkadai written in Tamil by Veda Prakash and published from Madras in 1989, the Shiva temple that existed at Mylapore before it was replaced by the St. Thomas church, had been identified with the original Kapaleeswara Temple. The Weekend Express published this letter in its issue of 13 January 1990 but suppressed its first and last paras. The first para had expressed astonishment that the “Indian Express allows its respected columns to be used to promote this Catholic romance as historical fact in this age of excellent and critical scholarship.” The last para was about the two temples replaced by the St. Thomas church and the evidence from the inscriptions and Veda Prakash’s book. This censorship was applied in spite of the fact that the Weekend Express had before it Veda Prakash’s book which the author had sent to the weekly for review several months before C.A. Simon’s article was flashed on its front page. The resident editor did not acknowledge this letter. And the Indian Express dated 29 January 1990 published on its city page an article, “‘Madras – City Of Neglect,” by Harry Miller denouncing the American evangelists for “disfiguring the city walls with their offensive posters” but repeating the St. Thomas story. Miller had reminded the Americans that “the very first evangelist – one Thomas by name – landed on our shores within a few years of the Crucifixion, some five centuries before America was ‘discovered’” and that “we have never needed another.” Ishwar Sharan wrote another letter to the Indian Express stating the facts which he had presented to the Express Weekend in his letter of January 13 and adding some more. He mailed a copy of it to Harry Miller as well. The Indian Express did not publish the letter. Nor did Harry Miller acknowledge or respond to it. Ishwar Sharan decided to do some plain speaking to this editor who had equated a brief and censored letter to the editor with a grossly misleading front-page article. In his letter dated 25 June 1990, he said: “So the truth of the matter is that you do indeed have space to promote the ancient lie about St. Thomas coming to India to get killed by the wicked Hindus and especially the very wicked Brahmins, but you do not have space at all in your newspaper when somebody tries to unmask the fable…. Swami Tapasyananda did not get a letter published in the Express Weekend as you have stated, but has written his own article in The Vedanta Kesari…. What is really distressing is that you not only connive at this vicious lie being published in your paper to malign the Hindus but that you support it by suppressing the truth no matter how often or in what form it is presented to you.” The resident editor did not care to reply. Till this time, Ishwar Sharan did not know that Swami Tapasyananda of the Ramakrishna Mission in Madras had also sent an article to the Express Weekend and had received neither an acknowledgement nor a rejection. All he knew was that the Swami’s article, ‘The Legend of A Slain Saint To Stain Hinduism’, had been published in the June 1990 issue of The Vedanta Kesari, the monthly of the Ramakrishna Mission in Madras. So it was a puzzle to him as to how the resident editor’s letter had named Swami Tapasyananda as the writer of a letter which was never published. The cat came out of the bag when he referred the matter to the Swami, and learnt that the latter had indeed sent his article to the Express Weekend in the first instance. Swami Tapasyananda’s article being as detailed and documented as his own, Ishwar Sharan sent a copy of it to C.A. Simon whose address he had succeeded in obtaining from the Express Weekend after waiting for several months. The reply he received from C.A. Simon was revealing. Firstly, Simon disclosed the sources of his information about the story of St. Thomas. He referred to two modern books, a few leaflets, a stamp issued by the Government of India in 1972, and a speech by Dr. Rajendra Prasad, President of India. Secondly, he admitted that he was no scholar of the subject and “not aware of the controversial version” given by the other side. Finally, he prayed: “I learned that you are going to publish a book and intend to include my article as the Christian version. As I do not stand for any religious sect or group you may desist from doing so. Instead you may refer to more authoritative works on the subject if you feel so.” The confidence with which he had written his article was gone as soon as he was made to know the difference between fact and fiction. What intrigued Ishwar Sharan, however, was the question: How had C.A. Simon come to know that Ishwar Sharan’s article was going to be published as a book? Ishwar Sharan had not conveyed the information to him. The conclusion was obvious: C.A. Simon had learnt it from the resident editor of the Indian Express! But in spite of all evidence presented to it regarding the myth of St. Thomas, the Indian Express persisted in promoting it. On 2 August 1990, it published a letter from Raju Thomas, a learned Christian of Madras. The letter was about the plight of Scheduled Caste converts to Christianity. It rebuked the rich and powerful Christian Church in India for demanding reservations for these converts while itself doing nothing for them although they constituted 85 per cent of the Christian population in India. But it was prefaced by the old lie that Christianity had reached Kerala “in the first century before it went to Europe.” Ishwar Sharan wrote another letter to the Indian Express on 3 August 1990 stating once again the true facts of the case. This letter was not published. But as a copy of the letter had been sent by him to Raju Thomas, the latter wrote a long letter to the Indian Express expressing doubts about the existence of Christianity in India in the first century AD. Raju Thomas’ letter, too, was not published. Ishwar Sharan came to know about it only when Raju Thomas wrote to him on 31 August 1990. “You may ask me,” said Raju Thomas in his letter to Ishwar Sharan, “if such is the case why did I assert that Christianity had come to India before it had reached Europe? My answer to this question is that I deliberately wanted an open debate and discussion on this subject…. We will be able to challenge and question such falsified histories and traditional beliefs only when we take up such issues to the public and do not keep them as the top secrets. But the question is how many of our ‘intellectuals’ are ready to have open-minded debates and discussions?…” He was not quite correct in blaming the intellectuals alone. It is true that intellectuals who take pains to study every subject from its sources, are few and far between in this country. But it is also true that an intellectual culture cannot grow in an atmosphere where the media is controlled by purveyors of palpable falsehoods or bullied into abject surrender by the thought police of Nehruvian Secularism. That the intellectuals were hungry for correct information on an important subject, was proved when Ishwar Sharan’s book, The Myth of St. Thomas and the Mylapore Shiva Temple, was published by Voice of India in February 1991. The book sold very fast. It was reviewed in leading journals and commented upon favourably by well-known scholars. The main chapter in the book carried Ishwar Sharan’s article submitted by him to the Express Weekend in reply to the one by C. A. Simon. The article had been expanded with additional material and informative footnotes. Besides, the book reproduced the articles by C. A. Simon, Swami Tapasyananda and Harry Miller. The letters which Ishwar Sharan had addressed to the Express Weekend on the subject of St. Thomas and the Santhome Cathedral were also reproduced along with his exchanges with the resident editor of the Indian Express and Raju Thomas. The crowning piece in the book was the confession by C.A. Simon. The most important development, however, was the stir which the book caused among the intelligentsia in Madras. The intelligentsia was aware that Christian missionaries had been using the St. Thomas story for maligning Hinduism and extolling Christianity. But it was not in a position to develop a dialogue because it lacked the correct information and the proper perspective. Now it was fully equipped and could hit back. The International Institute of Tamil Studies, an academy sponsored and financed by the Government of Tamil Nadu, had published in 1985-86 a book titled Viviliyam, Tirukkural, Shaiva Siddhantam Oppu Ayu. The writer of the book was M. Deivanayagam, a Christian scholar supposed to be an expert on Tamil antiquities. The University of Madras had conferred a doctor’s degree on the author for writing this dissertation. The thesis propounded by him was that the ancient Tamil saint, Tiruvalluvar, had become a disciple of St. Thomas and converted to Christianity. Stray sentences had been picked up from the Tamil classic, Tirukkural, and lined up with stray sentences from the Bible in order to prove the point that the Tamil saint owed his teaching to his contact with the Christian scripture. This book by Tamil and Shaiva scholar Vidwan Arunai Vadivel Mudaliar is the refutation of Deivanayagam’s spurious doctoral thesis Viviliyam, Tirukkural, Shaiva Siddhantam Oppu Ayvu. Mudaliar’s refutation was published in 1991 by the International Shaiva Siddhanta Institute at Dharmapuram, Tamil Nadu. Some scholars had written letters to Deivanayakam pointing out that his book was full of distortions and altogether misleading. But Deivanayakam had remained unrelenting. The Dharampuram Shaiva Math had invited the Christian scholar to a conference of Tamil scholars, and requested him to disown the thesis. He had come to the conference but refused to yield ground. Finally, the Math had prepared a book of refutation. It had been written by an eighty-five years old Tamil and Shaiva scholar, Arunai Vadivel Mudaliar. Ishwar Sharan’s book on St. Thomas came as a shot in the arm of Mudaliar whose book was released by Sarojini Varadappa in a gathering of three hundred Tamil and Shaiva scholars held in a packed hall at Madras on 24 October 1991. The meeting was presided over by Justice N. Krishnaswami Reddiar, a retired judge of the high court. He denounced Deivanayagam’s book as “trash in the name of research.” He quoted from Ishwar Sharan’s book to point out that “the visit of St. Thomas to India was a myth”, and wondered how a book like that by Deivanayagam could be published by an institute set up by the government and honoured by a university with a doctorate. Dr. R. Nagaswami, eminent archaeologist, also censored the institute and the university for sponsoring a spurious thesis, and said that the St. Thomas story “was a ruse to spread Christianity in India.” He cited what he knew from his own excavations at the Santhome Church. Some other speakers, too, took Deivanayagam to task. Meanwhile, Ishwar Sharan had discovered another Christian fraud. It came to light that Deivanayagam had collaborated with Dr. R. Arulappa, the Catholic Archbishop of Madras, in writing another but similar book, Perinbu Villakku, published in 1975. The Archbishop had also tried to prove that Tiruvalluvar had come in contact with St. Thomas during the latter’s travels in South India, and converted to Christianity. But he had gone much further, and forged ‘evidence’ on palm-leaf scrolls in support of his thesis. He had employed a Hindu scholar of Christianity, Ganesh Iyer, for this purpose, and paid him to the tune of 15 lakh rupees. The fraud had been exposed when someone put the police on the trail of Ganesh Iyer. The case had dragged on in the Madras metropolitan court from 1980 to 1986 when Ganesh Iyer was sentenced to ten months’ imprisonment on various counts. But Dr. Arulappa had got him acquitted by means of a civil suit for compromise filed in the Madras High Court at the same time that the criminal case was going on. Ganesh Iyer had spilled the beans soon after. Two conclusions emerged clearly from this particular Hindu-Christian encounter. Firstly, although the major print media in India is owned by Hindu moneybags, they have handed it over to Hindu-baiters of all sorts. Secondly, there is no law in the country which can deal with intellectual crimes committed by Christian scribes ever so often. In fact, the existing law comes down heavily on those who expose those crimes; they are branded as Hindu communalists and accused of creating enmity between communities. Papacy: Its Doctrine and History, Voice of India, New Delhi, 1986. Stephen Neill, History of Christianity in India: The Beginnings to 1707 AD, Cambridge University Press, 1984, p. 27. Pandit Jawaharlal Nehru provides an excellent example of how some innocents abroad lap up lies sold by powerful organizations. “You may be surprised to learn,” he wrote to his daughter, Indira, on April 12, 1932, “that Christianity came to India long before it went to England or Western Europe, and when even in Rome it was a despised and proscribed sect. Within 100 years or so of the death of Jesus, Christian missionaries came to South India by sea…. They converted a large number of people” (Glimpses of World History, CUP reprint, Fourth Impression, 1987, p.87). Articles and images on this web site which contain copyright material that has not been specifically authorized for use by the copyright owner, has been made available here to advance learning and to inform the Hindu community at large of issues that may concern it. We believe this constitutes “fair use” of copyright material as understood in Indian and US copyright law. Images may be added to posts by the website editor without consulting the authors of articles.